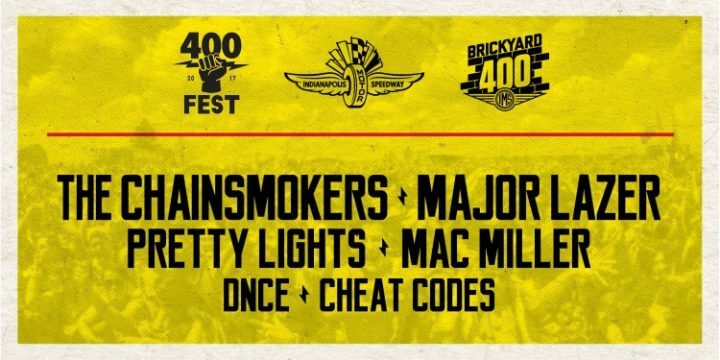 400 Fest, the two-night concert taking place during Nascar’s Brickyard 400 event, is set for July 21 and 22 at the Indianapolis Motor Speedway. This year’s lineup includes Major Lazer, Mac Miller, Cheat Codes, The Chainsmokers, Pretty Lights, DNCE, and more. 400 Fest tickets are on sale now and we’ve got your chance to win a pair of two-day passes to the festival. 2. SUBMIT the simple entry form below. 3. SHARE for extra entries. Deadline to enter is Fri., July 14 at 11:59 a.m. CDT. One submission accepted per person. Must be 18+. Travel and lodging not included. Good luck! **If you’re having trouble viewing the entry form, click here to open it in a new tab. By submitting your entry, you agree to our Contest Rules and to receive occasional emails from contest sponsors.